Tag Archive | "white pine"
This photo shows normal fall needle drop in a white pine tree. Photo from purdue.edu. During fall, people notice pine trees dying. They become concerned about what unexpected fungal blight or insect infestation is killing trees. Events occur in our neighborhoods that generally escape notice and then suddenly capture our attention. Broad-leaved trees like maples, cherries, and aspens drop their leaves each fall and stand naked all winter in wait for the spring growing season. Losing leaves helps them avoid structural damage that would occur from the weight of snow or ice that would get caught on leaves during the winter. The weight would snap branches. If the trees maintain their large leaves during winter, they would fail. Frozen water in leaves would burst cell membranes causing leaves to die. 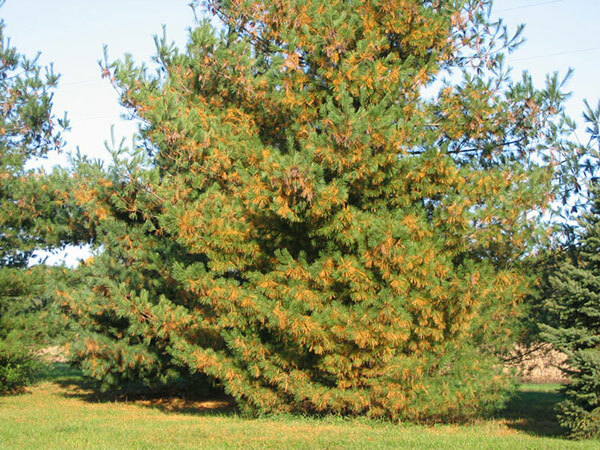 In our yards and in wild places over yonder during fall, one is likely to see massive brown needles on pines. This is very noticeable for our State Tree, the White Pine. 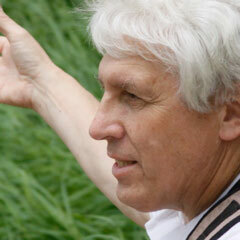 People contact me inquiring what is wrong that trees are dying. In most cases I reassure nothing is wrong and the trees are healthy. It is normal for needles that are three years old to die. Younger needles closer to the branch tip remain green and healthy. The older needles away from the tip wear out from old age. They are also tucked farther back into the tree instead of being more exposed to sunlight. 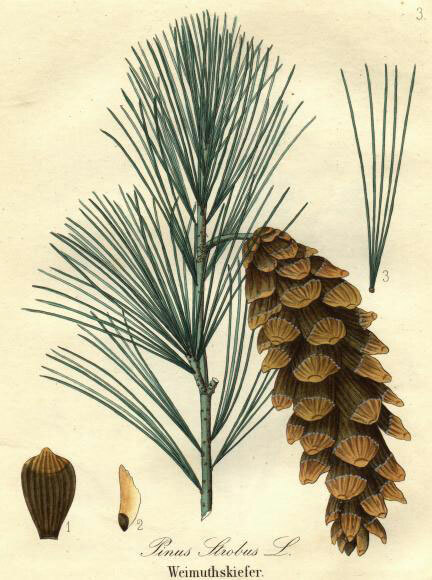 Look at pine branches to notice the brown needles are clustered away from the branch tip. Closer to the tree trunk notice that there are no needles. In previous years the bare branch held needles. Each year as the branch extends new growth with fresh needles, old needles die at the inner portion during fall. A layer of needles builds annually under pines, where pine pitch helps prevent their decay. Usually a thick duff of pine needles is found under the trees in wild nature niches. Yard needles are often removed. How is it that pine needles avoid frost damage that would kill broad-leaved tree foliage? One advantage is pine pitch helps prevent frost damage by lowering the freezing temperature like antifreeze. Needles also contain sugar that functions like antifreeze. That only works to a limited point and then water in the cells would freeze and burst cell membranes causing the needles to be killed. To survive very cold weather, water must be mostly removed from the needles. Trees transport water from needles and branches to roots in a similar manner to broad-leaved trees where sugar and nutrients are stored. Living needles that did not turn brown in fall cling to life throughout the winter but are mostly dormant. During a warm sunny spell in midwinter, green needles are warmed and become active. This is dangerous for the needles and tree. The needles produce sugar by photosynthesis where they combine carbon dioxide and water in the presence of sunlight energy. The winter needles contain little water and that helps prevent frost damage. Unfortunately, using the limited amount of water can dehydrate the needle to the point of death during photosynthesis. The trees are unable to ship needed water from the cold ground unless the soil temperature is above 40 F. The needles in warm air and sunlight make the effort to produce sugar but instead die from lack of water for completing the process. What were healthy needles in late fall become victims of “winter burn.” The winter burn might only affect some needles on the tree but some years I have seen entire trees “burned” to the point that it causes tree death. 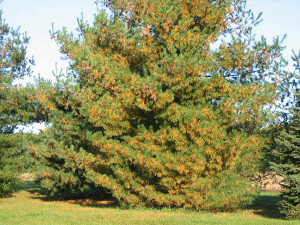 Living is not easy but brown needles on pines in fall is usually not a sign of stress or tree death.